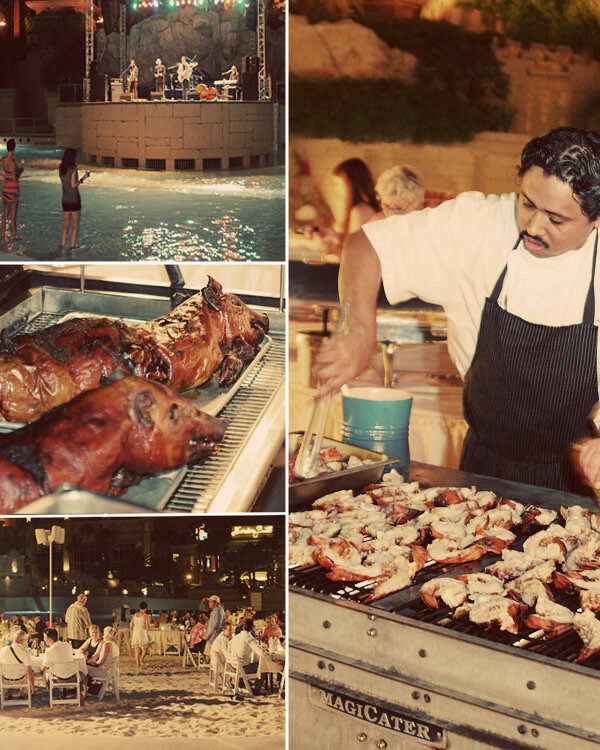 We’ve been to our fair share of food festivals over the years and thought we’ve experienced it all until Vegas Uncorked 2012. Hosted by Bon Appetit, Vegas Uncorked brings together some of the world’s finest restaurants and renown chefs right to your table. Literally. 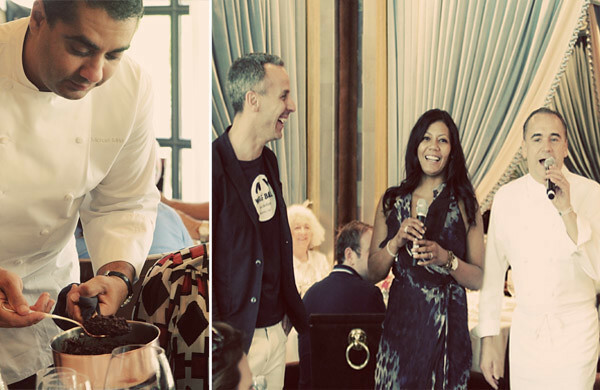 Michelin starred chef Michael Mina dishing up forbidden rice with foie table side? Check. The exuberant and beautiful Kimchi Chronicles host Marja Vongerichten stopping by your table to give you the skinny on all the variety of panchan she made? Yes! Bluff the jovial chef José Andrés out of his stack of chips in a no holds no limit Texas Hold’em tournament? Yes, Yes! Have Francois Payard swipe warm chocolate ganache on your lips? Excuse our French, but hell, yes! In a nutshell, Vegas Uncorked is the ultimate event for the food and wine lover, not just for the sheer variety of chefs, food, and restaurants, but for the unique events and intimate settings that allows your average home cook to chat it up these increasingly popular celebrity chefs. We could have asked the adopted Marja about her panchan, but instead asked her about how she found her birth mother and finding her roots in though the foods of Korea. 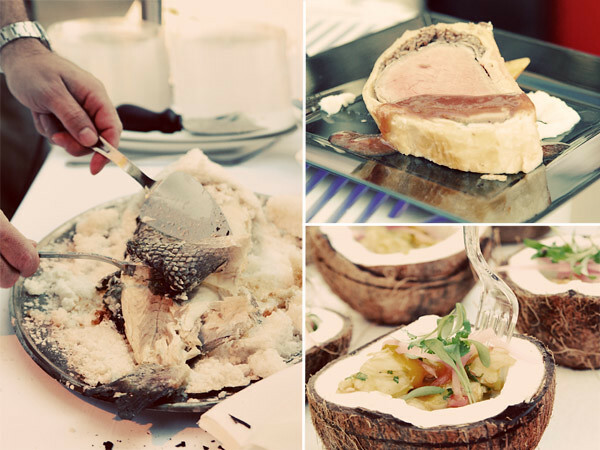 But if meeting one chef on an intimate level is not your thing, how about meeting them all at once at the Grand Tasting? It wasn’t that long ago that the venerable all- you- can eat buffets would be the highlight of our family trips to Vegas. This last trip however, we bypassed the buffet line altogether to sample almost of all of the finest Los Vegas, and indeed some of the world’s finest restaurants all in one evening. 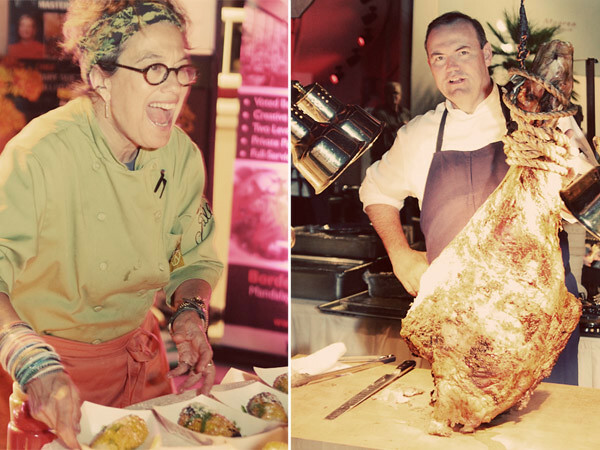 With over 50 world renown chefs and restaurants and over 100 of the worlds finest wineries in the newly renovated Garden of the Gods Pool and Oasis at Ceasars Palace, the the Grand Tasting is an epicurean paradise for the over 2500 guests in attendance. While crowded, there was never a long wait for the expansive options such as salt baked whole seabass from Estiatorio Milos of The Cosmopolitan, or Gordon Ramsey’s beef Wellington, or Bobby Flay’s Mesa Grill coconut ceviche. 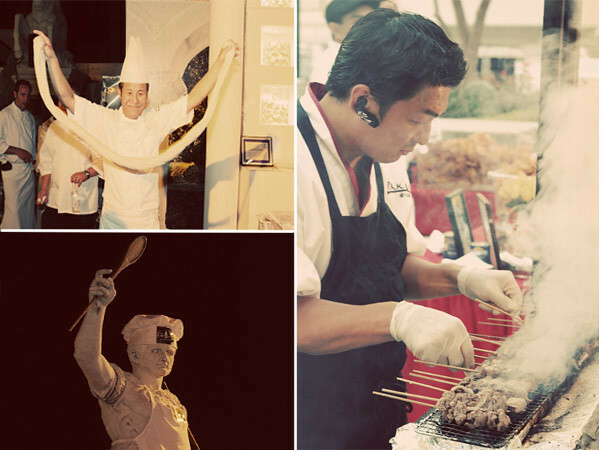 While there was no shortage of megastar chefs such as Todd English, Guy Savoy, Nobu Matsuhisa on hand, favorite local chefs made a strong presence such as Endo-san of Raku Abriya who was manning his charcoal robata grill of succulent skewers of kurobuto pork cheeks. Meanwhile, another local, chef Guo-Ming Xin of Beijing Noodle #9 was there demonstrating the magical hand pulled noodles technique, a tradition pass down through the centuries. Move over Celine, this was easily one of the best shows in Vegas. Even chef Ceasar was on hand ditching the toga for an apron and toque. When we couldn’t stuff our bellies any further, it was time to head hit the gambling tables, after all this is Vegas right? 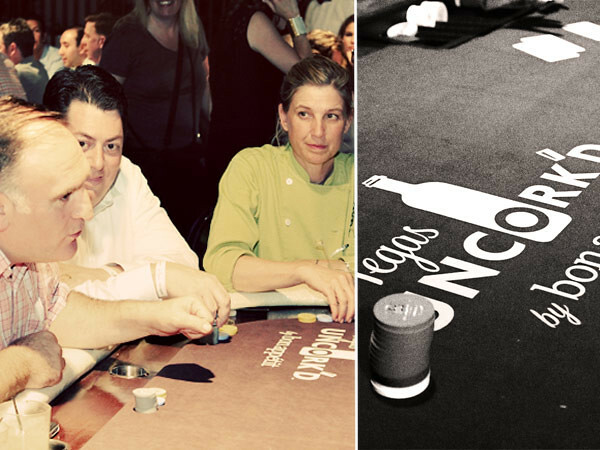 Luckily for us, Vegas Uncorked also sponsored a celebrity chef poker tournament where a buy in allowed you to rub elbows with the likes of José Andrés and Mary Sue Milliken. Bluff them or go all in if you dare, it was a fast pace no limit affair with the prize going to local charities. The following day, in what turned out to one of the best highlight of many on the trip, was a French pastry lesson from Francois Payard himself. A third generation pastry chef, Chef Payard commanded the room of eager learners, passing along tips from his grandfather. “Use your lips as a thermometer, he says, it’s the most sensitive part of your body,” as he daubs silky chocolate ganache on students lips to gauge the correct temperature. 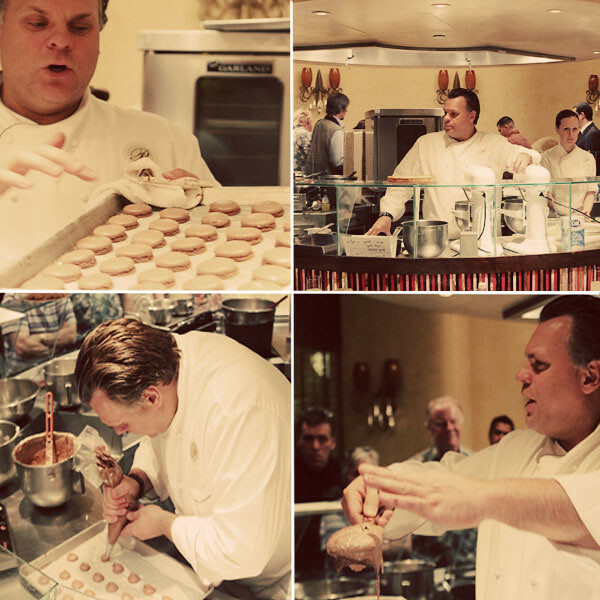 Chef Payard demonstrated a quick 10 minute chocolate pudding cake, lemon tart, and of course his famous macarons. While we prefer the French method, Payard has used the Italian method for the past 15 years. He emphasized following the recipe precisely and concentrating on proper technique as keys to successful macaron making. Another tip he offered was to rap all four sides of the baking tray on the counter for perfectly round macarons. Also, for large batches, instead of using the spatula to macaronage, try using a gloved hands to get a better feel for the batter. Finally, to cap off the night’s festivities, we went to the Surfside Clam Bake at the Mandalay Beach. We didn’t see many clams, but we’re not complaining as there were succulent lobster tails perfectly grilled by Rick Moonen of RM Seafood, fresh shucked Louisianna oysters and plump shrimp, as well as suckling pig and whole roasted beef leg by Charlie Palmer’s Aureole. Bumping live music, the roar of the waves, the sand at our feet and the unlimited Mionetto prosecco and sparkling wines made for a wonderfully festive beach party. The bubbly and effervescent Susan Feninger of Border Grill greets guests with her rendition of elotes, grilled corn on the cobb with Mexican cotija cheese. Charlie Palmer stands proud with his whole roasted leg of beef, carved to order. We couldn’t have dreamed of a more unique experience to end our inaugural experience of Vegas Uncorked. And to think we only experience two days out of four in this multiday festival, missing out on food truck and brunch events. Whether you’re a home cook, wine enthusiast, foodie, or traveler wanting to get the most out of your Las Vegas dining experience, it would be wise to plan your next Vegas vacation around Vegas Uncorked. 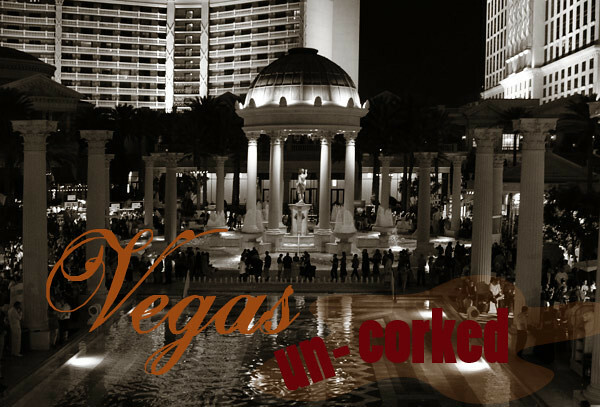 We can’t wait to uncork Vegas in 2013. *Disclaimer: We were provided with press passes to the events. However, our opinions are our own. 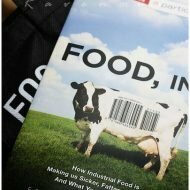 Food, Inc. the movie might change how you eat forever. 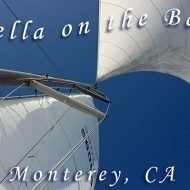 Plus, free book giveaway! Vegas is known for abundance and extravagance, so why not take it all the way with an event like this! We’ve never been to a food festival in Vegas, so now you’ve provided a great pov on what happens. Looks like you had fun. This is the most extravagant food event I’ve seen yet! I would have been at the surfside clambake all night. it truly is…pebble beach is great, but inside a big tent vs. the pool oasis is a no brainer!